Last week I got to see Thao and the Get Down Stay Down. The show sold out, and there were many people in line outside when the show began. I saw many of them pumping their fists with smiles, because of the window, they could still see and hear the show. 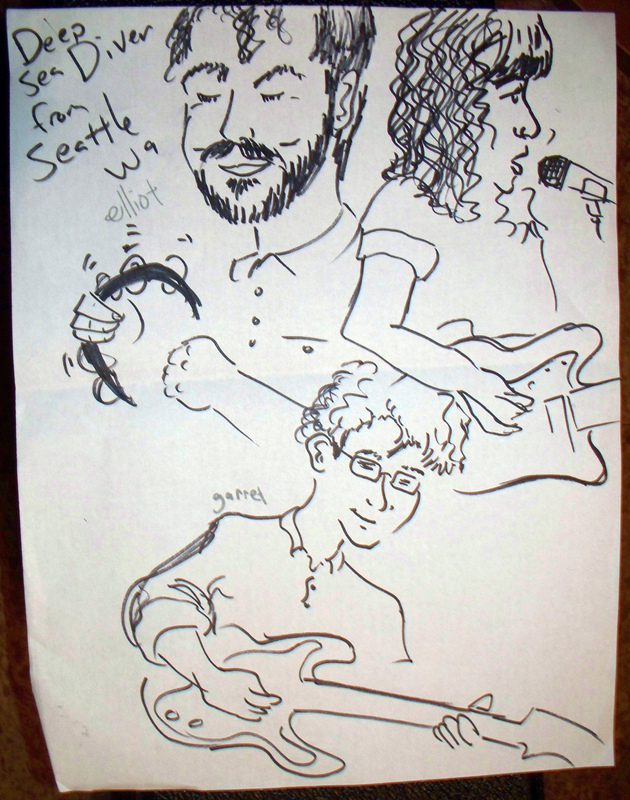 Wow, her band sure looks humorless in my drawing. They do seem to be concentrating on the music while they play. Here are some drawings I made. I left a lot of the pencils in, because they contribute a great deal of excitement, action and fun. 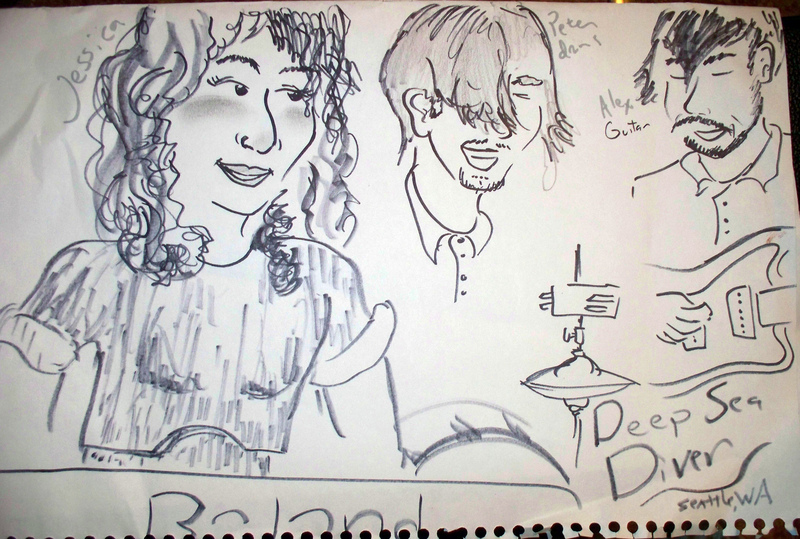 Also, I drew Thao and her guitarist Kyle three times each. She doesn’t have a band made of clones, as my illustration might suggest. 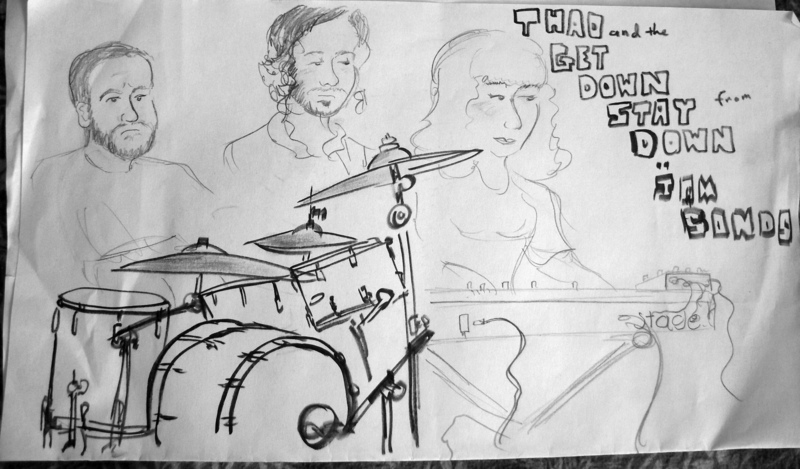 Her band plays very tight, I caught them play in Austin at SXSW at a show at 2pm with Phox. A highlight of the show was “Holy Roller” from her new album. It was especially fun when she got out an electric guitar and placed it on a keyboard stand and played it like a pedal steel. I do listen to her album “We Brave Bee Stings and All” all the time at home and it would be transplendent to hear her perform that album from front to back, but I really don’t mind her new material. She certainly performs with passion. Her crowd was enthusiastic. She played a fun 60s girl group pop song for a second encore. In a bizarre coincidence, she is doing a show with my favorite comedian, Maria Bamford but it is in Minessota.